There’s no shortage of mapping apps on Android, but most of these are aimed at motorists or at the very least at mapping proper streets. ViewRanger on the other hand focuses on the tracks and trails people love to hike. It offers maps for much of the world, including the US and UK, with data coming from a range of sources, such as Ordnance Survey, OpenStreetMap and Topo Map. 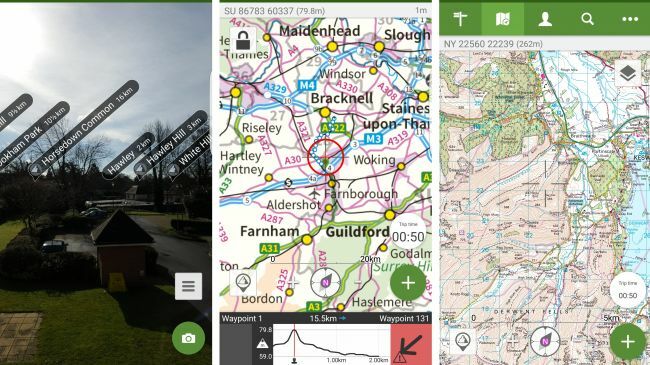 As well as providing maps of the world’s wilderness, it also lets you create or follow trails, view your heading, bearing, latitude, longitude and altitude, and download maps for offline use. But perhaps the best feature is Skyline, which uses your phone’s camera to deliver an augmented view of the world, with the name, direction and distance of various locations, landmarks and waypoints overlaid on the landscape. The only bad thing about ViewRanger is that it’s not free. You can download the app itself free of charge, but (with few exceptions) the actual maps within cost money, and depending on how big and detailed a map you want, you can spend anywhere from a couple of dollars/pounds to hundreds if you’re looking to map the whole world.